Being marked with ashes is a public acknowledgement that one is a sinner, as we all are. In the fourth century, public penitents dressed in sackcloth and were sprinkled with ashes to show their repentance. The practice of public penance gradually fell into disuse from the eighth to the tenth centuries. Instead, it was replaced by private confession and private penance. Our current celebration of Ash Wednesday began to develop in the eleventh century. By this time had become customary to receive ashes at the beginning of Lent. The Christian use of ashes is rooted in the Jewish custom of sprinkling ashes on the head as a sign of repentance. Contrary to popular belief, Ash Wednesday is not a holy day of obligation. It is, however, a spiritually and liturgically significant celebration which sets the penitential tone for the next forty days before Easter. The ashes are a symbol of penance and reconciliation. Ashes are used in the Catholic Church not only on Ash Wednesday, but also in the rites for the consecration of an altar and for the dedication of a church. The ashes are the burnt palms used on Passion Sunday/Palm Sunday of the previous year. These palms are burned in the Easter fire, lit on the Saturday night that marks the transition from Holy Saturday to Easter Sunday. Many parishes allow for you to bring back your palms so that they may be used on the next Ash Wednesday. If this is the case, why do Catholics make a public display of wearing ashes? Ash Wednesday is a day of fast and abstinence from meat. This is one of the Precepts of the Church, which Catholics must follow. This means that Roman Catholics may eat one full meal, and they may eat two small meals as well. The two smaller meals must not equal one full meal. There are exceptions to these rules. Everyone 14 years old or older must not eat meat or foods made with meat. Younger children may eat meat. Those from ages 18-59 must fast. If you are younger than 18 or older than 59, you do not have to fast. Women who are pregnant or nursing also do not have to fast. Furthermore, if you have a health problem that makes fasting unhealthy for you, you do not have to fast. If you are exempt from the fasting rules, it is a good idea to substitute another penance. Lent is a great time to go to confession and turn away from sin especially any mortal sins you’ve committed. To get started with that learn to go to confession and learn the conditions for a mortal sin. Can a Catholic receive ashes at a Church of another denomination? Ashes are not used for the consecration of an altar and the dedication of a church . Sacred Oils are used. At the Ash Wednesday service that I attended last night some people knelt after receiving ashes and some sat in their pew. Which is appropriate or doesn’t it matter? Are teachers allowed to give Ashes to their students? Or are you supposed to get them from the priest only? you can receive them only from someone who has had training, eg. priest or a Eucharistic Minister. 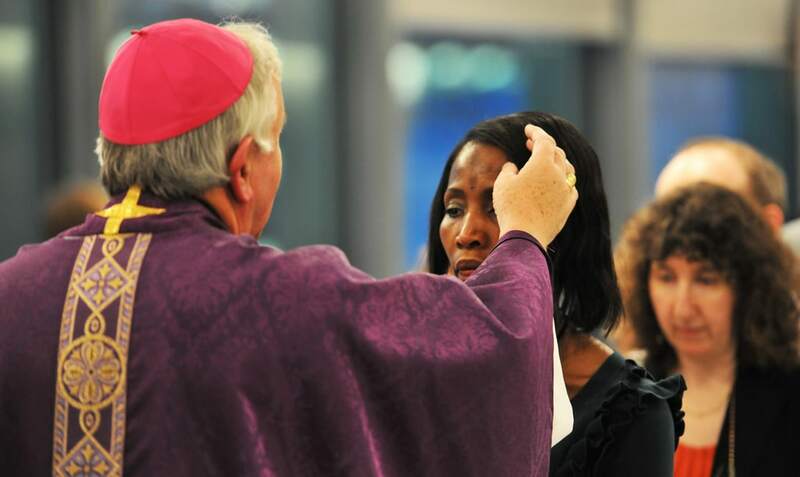 Are you required to attend mass on Ash Wednesday in order to receive ashes? Simply saying “Amen” will do. My question is about scheduling weddings, quinceaneras, anniversary celebrations, baptisms during the lenten season. Are they allowed to be celebrated during that time of year? Should we abstain from setting these type of events during lent? The church is not wanting to do this for my daughter during lent. Hi Janie. There is no canonical restriction during Lent (except for certain days like Ash Wednesday) that baptisms, etc. could not be performed. This decision is on that each parish may make on its own (unless otherwise directed by the bishop). The reasons for this restriction are many. One is that the season of Lent is a penitential season. In keeping with themes of Lent a parish may choose not to celebrate baptism, weddings, etc. until Easter, a season of great joy that the Christ has risen. Another reason may be of simple logistics. For some parishes Lent can be a busy liturgical season and there are not enough people resources at the parish to be able to add additional events. So, technically yes these celebrations are allowed, but a bishop or pastor may choose not to do them.